The Curse of the Cat People (1944) was the sixth in a series of “horror” films produced by Val Lewton during the early 1940s and is plotted as a sequel to the first film in that sequence, Cat People. But this sequel, directed by Gunther von Fritsch and Robert Wise (his first directorial outing), is vastly different from the earlier film (directed by Jacques Tourneur) and suffers in the comparison. It is an ingenius characteristic of Lewton’s films that the expressionistic presentation evokes a sense of dread suggesting supernatural events are in play. At the same time there is always a rational explanation for these same events, and the viewers are kept on the dividing line between the two contrasting interpretations. It is this very sense of doubt that make the films plausible for the more sophisticated viewer: the viewer’s imagination is always kept on this knife edge. In The Curse of the Cat People, however, the sense of dread is only toyed with, but largely suppressed. On this occasion it is a child’s clearly imaginary fantasies which are evoked and in which we are suppose to engage, but it doesn’t really work. Instead of truly immersing ourselves in the child's fantasy world, we are only able to see her from the outside – sympathetically, to be sure – but it's not the same sense of shared participation as in other Lewton films. The story picks up some years after the events of Cat People. Oliver and Alice, who were lovers at the end of that movie, are now married and have a six-year-old daughter, Amy, who is criticised by her parents for being too dreamy. After seeing an old photograph of Oliver’s first wife, Irena, Amy conjures up a special imaginary friend with Irena’s form. Amy also stumbles upon a spooky house in the neighbourhood, where an eccentric old actress befriend s Amy and tells her scary tales. Amy wanders off one evening and gets lost, eventually finding her way to the spooky old house. Her alarmed parents alert the police and set about searching for her. They finally trace her to the old house, and the film ends happily, with the parents accepting a child psychologist’s prescription that if they love her unconditionally, Amy will stop making up imaginary characters. This film fails on several levels, and I find it surprising that many reviewers revere the movie as a wonderful fantasy. The narrative, such as it is, barely moves forward. The only issue is that there is a child who is criticised by her parents for making up imaginary friends. She gets a spanking for this and is ostracised by her friends. At the end, the only resolution is that she still has her imaginary friend, but her parents are now more accepting of her. This is not a compelling plot. The whole intriguing idea of “cat people” (people transformed into ferocious cats when their passions are arounsed) from the earlier film is dropped here. There are no cat people in the film, and there is no curse. 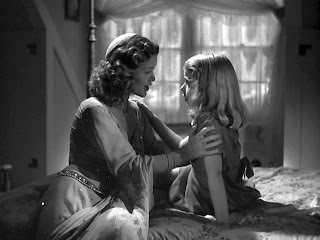 At one point in the film, Alice asks rhetorically if their family has been cursed – a line that was perhaps inserted into the dialogue merely to justify the film’s title. The cinematography and editing are below the standards of Lewton’s films with Tourneur and Robson. In fact there are so many jarring jump cuts in the film that one has to wonder if Wise deserves his editing credit for Citizen Kane (1941). There are numerous meaningless overhead shots that don’t fit in, and the dramatic changes in lighting that are supposed to signal Amy’s fantasies appear very artificial and are ineffective. There does appear to be some potential for drama at the old house, but this is just a tease. For example, there’s a tense, dramatic moment when Amy and family servant, Edward, are trying to leave the spooky old house and are unable to open the door to get out. But this is a complete red herring and doesn't lead anywhere. In fact the entire drama between the old actress and her estranged daughter is empty and comes to nothing, despite the poorly motivated suggestion at the end of the film that the daughter is about to murder Amy. 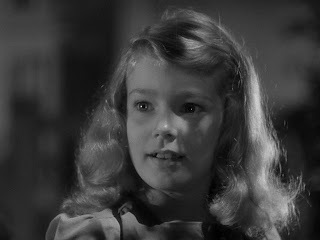 And speaking of that daughter, since many of the characters from Cat People reappear in Curse of the Cat People and are played by the same actors and actresses, there is a particular problem with the old actress’s daughter, Barbara Farren. This role is played by Elizabeth Russell, who appeared in Cat People as a mysterious cat-like women who taunted Irena and spoke Serbian. Although the physical identification of Russell is obvious, there’s no indication in The Curse of the Cat People that Barbara Farren, not exactly a Serbian name, is this same person that was in Cat People. What are we supposed to make of this duplication? There are a couple of redeeming elements to The Curse of the Cat People. The scenes at the old house and the old actress’s (Julia Dean's) scary storytelling do pick up our interest a bit. There was potential here, but it was just left hanging without being developed. And Ann Carter, in the role of Amy, is wonderfully sensitive and believable. She carries the entire film on her back, so to speak, and almost makes it worthwhile. But not quite.